The following is a guest post by Zeena Aljawad, an Iraqi living in California. She is currently involved in The Iraqi Oral History Project, which is dedicated to collecting and preserving oral histories from immigrants and refugees from Iraq. For artists across the Arab World, being likened to Fairuz is a big deal. This is particularly true for those who looked up to the Lebanese diva early in their careers. Among the most famous artists compared to her is the Iraqi-Armenian singer Seta Hagopian, a woman who is often dubbed the “Fairuz of Iraq” and whose music lives on in many Iraqi homes. Born on July 28, 1950 in Basra and raised near the southern Iraqi city’s famous canals, Seta started singing the songs of classic Egyptian singer Shahrazad at the age of four. She grew up in a household that valued music; her grandfather would sing throughout his day in the house. Her father, Arshak Bedros, was a tennis player and her uncle was a body builder, but they were both musicians as well and had a band together in Basra. They attended musicals in Armenian and Arabic that were a favorite and popular pastime for many Iraqis. Her grandparents even had a room that was dedicated to music, equipped with records and a phonograph. When Seta started to consider her career in music as a singer in the 1960s, she tried to adopt the style of Mohammed Abdul Wahab, one of the most renowned classical Arabic singers and composers of the time. Abdul Wahab composed more than 1,820 songs, including songs for legendary Egyptian singers Um Kalthoum and Leila Mourad. Although Seta admired his work, she soon realized that she wanted a different feel to her music. She wanted to make it contemporary, while keeping some elements of traditionality: an interest which drove her to increasingly incorporate Western instrumentation alongside traditional Arabic melodies. Her first two singles: “Leil el Sahar”/ “Sleepless Nights” and “Ma’indal Dalooni”/ “I Do Not Know the Way, Lead Me,” established her individuality on the Iraqi stage. Seta’s career prospered in the 1970s, during which time she reached the height of her fame in Iraq and across the Arab World. With the beginning of the Iran-Iraq War in 1980, however, Seta retreated from the world of song. In the years after the first Gulf War and the implementations of sanctions against Iraq, Seta’s career suffered along with all of the arts in Iraq. She moved into directing, emerging as the director of a number of Arabic TV shows including “Soal wa Soal,” “Shatharat Molawana”, and Ala Abwab el Madares”. She also directed a number of music videos for Iraqi singers including Kathem al Saher, Ared Muhsin, Adel Ugla, Jaafar el Khaffaf and many more. Amid the continued decline of Iraqi artistic life during the 1990s, she emigrated to the Gulf in 1997, before moving to Canada in 2013. Seta’s connection to Iraqis inside of Iraq and in diaspora is kept alive through her Facebook page, which has nearly 200,000 likes. This page is where nostalgic Iraqis today express their love for Seta and her music and where Seta can directly communicate with her fans. She has a kinship with them; they call her Mama Seta and she calls them her family. 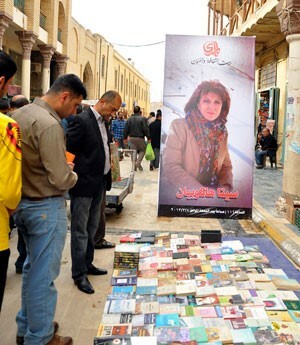 A poster of Seta Hagopian along Baghdad’s famous al-Mutannabi street, the Iraqi capital’s largest book market. Searching for moments and pieces of home is commonplace for Iraqis. Seta’s music, through her Iraqi dialect, takes their imagination or brings back memories to sitting at a coffee shop on the shore of the Tigris River in Baghdad, sleeping on the rooftops on hot summer nights in Mosul, or walking through a date palm tree grove in Basra. Although there is not much literature or documentation about Seta Hagopian’s life apart from a few recorded interviews, her contributions to Iraqi society and music do not go unnoticed by Iraqis in the homeland or transnationally. Seta’s legacy carries on, not only by her music, but also by her daughter, Nova Emad, who has become a singer herself. Nova Emad has experimented with trance and Bossa Nova styles in her work, in addition to often singing her mother’s songs. Mama Seta raised us with warmth in her voice and her unique style; we would do well, as her family, to share her with generations to come. Thank you, Mama Seta. Thank you for the beautiful article about my mother (Seta Hagopian) There are a couple of things that are incorrect though. My mother retired her musical career to become a director, and she studies at the institute of Fine Arts for 4 years. She has directed many Tv shows including (Soual wa Soual – Question and another Question) ( Shatharat Molawana – coloured sparkles) ( Ala Abwab el Madares – On the doorsteps of Schools) and (liqaa maa fanan – an interview with an artist) to name a few, in addition to short movies for the Unicef and numerous music videos for many iraqi singers including (Ared Muhsin, Adel Ugla, Kathem El Saher, Jaafar el Khaffaf and many more). Thank you so much for graciously providing this information about your mother’s life, career, and work! They have been added to the article. Very much appreciated.